U.S. #1287 from the Prominent Americans series. On June 11, 1963, President John F. Kennedy delivered a television and radio address calling for the Civil Rights Act of 1964. Early on in his career, Kennedy did not speak out frequently concerning civil rights. However, his brief term in office came at a tumultuous time in U.S. history, when the matter of civil rights became the defining issue of a generation. U.S. #3937f from the To Form a More Perfect Union sheet. 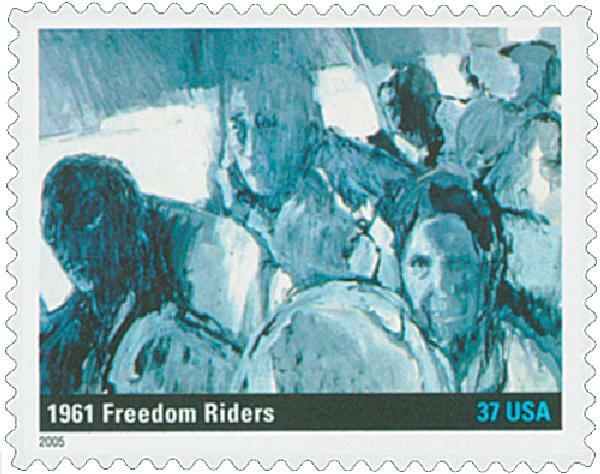 Mere months into his term, Kennedy faced his first major civil rights decision, concerning the 1961 Freedom Riders. That spring and summer hundreds of people rode Southern interstate buses to oppose the practice of segregation, which had been outlawed on public buses. Some were arrested and attacked by local mobs. 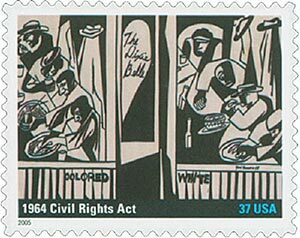 The violence and imprisonments brought the civil rights issue to national attention and showed the federal government was not enforcing its own laws. In response, Kennedy sent federal marshals to guard the riders, though he stressed that his decision was a legal issue, rather than a moral one. He was being cautious so as not to infringe on the southern states’ rights. 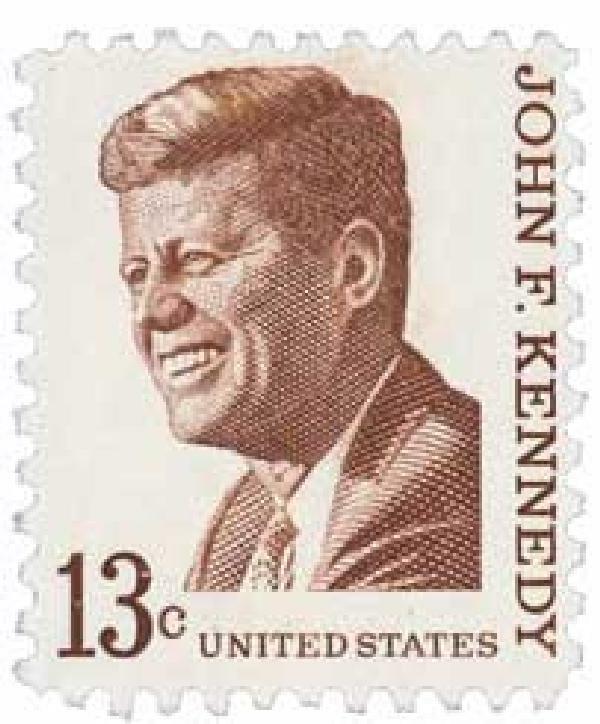 U.S. #1246 was issued for JFKs 47th birthday. Kennedy was further moved by the Birmingham campaign in May 1963, in which African American students staged nonviolent protests. Then on May 21, 1963, a federal judge ruled that the University of Alabama must allow two African American students attend its summer courses. The governor of Alabama strongly opposed the order and insisted on making it a public display. On June 11, the students attempted to enter the school’s auditorium to register for classes, but the governor himself blocked the doorway. Kennedy then ordered federal troops to order him to step aside and allow the students to register. 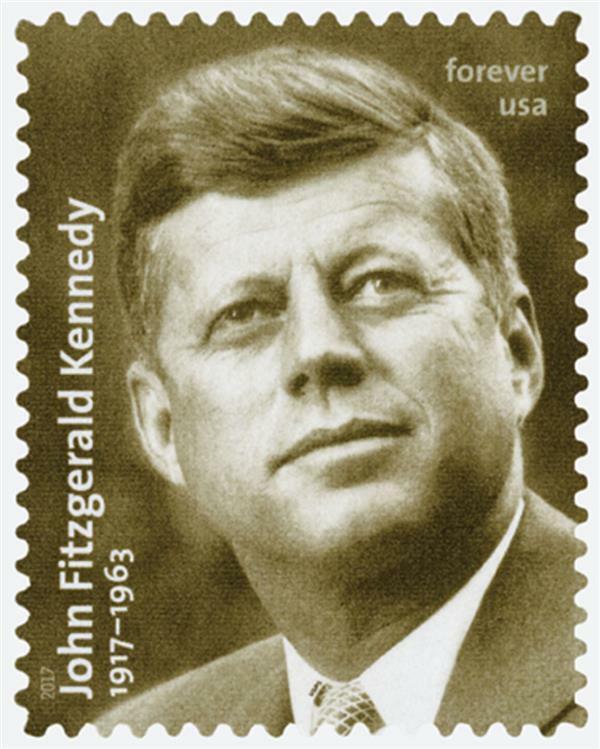 U.S. #5175 was issued for JFKs 100th birthday. U.S. #3937g pictures Dixie Café by Jacob Lawrence. Kennedy’s address was well received by many people in the civil rights movement. Martin Luther King Jr. stated, “Can you believe that white man not only stepped up to the plate, he hit it over the fence!” Days later, on June 19, Kennedy sent his bill to Congress. Passage of the bill would be one of his major goals in the coming months, but he wouldn’t see it happen during his life. His successor, Lyndon B. Johnson, passed the Civil Rights Act of 1964 over a year later on July 2. Click here to view part of the speech or here to read it. 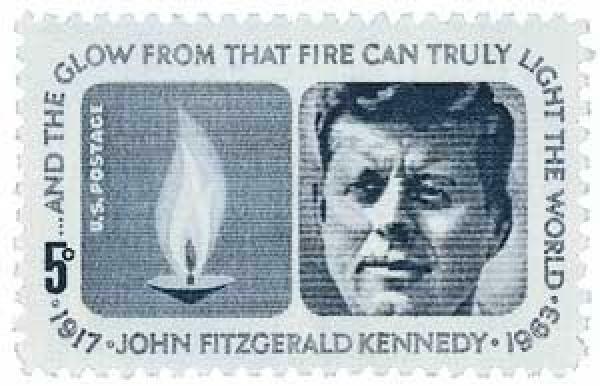 Click here for more JFK stamps. 10 Responses to "This Day in History… June 11, 1963"
other social institution. The state with the largest membership in the KKK was Indiana. LBJ was Kennedy’s “successor”, not predecessor! It is both depressing and just plain wrong that this Civil Rights Bill took almost 100 years to take place; I would argue that there should not have been a reason for such a Bill (but sadly there was). A good history and life lesson; thank you Mystic for a timely article. Now, let’s get on with life; there is too much to do to make this country great than to bicker and argue about stupid things that don’t matter. I believe that Lyndon Johnson was President Kennedy’s successor, rather than predecessor. I always thought that US #1246 was poorly designed. They tried to force too much into it, which resulted in JFK’s head being squeezed into a box but still not quite fitting. I don’t understand why there are no comments pertaining to this subject. We had a situation unequaled in our history and cannot be forgotten. Don’t you mean that Lyndon Johnson was Kennedy’s successor — not predecessor? I don’t think you meant to say that Johnson was Kennedy’s predecessor. Lyndon Johnson when In Congress was who got the first two major civil rights bills passed. As the VP the only thing he agreed with Bobby Kennedy was the civil rights acts then and 1964 as the President. JFK was a great speaker but a real hypocrite about a lot of subjects. At the time most Americans admired him, but did not know the true character of the man or his father. Like someone above said, give LBJ the real credit, with an assist from Attorney General Robert Kennedy and of course Congress who passed the act for the President to sign.